A Fabulous TDF Designer Detail ! 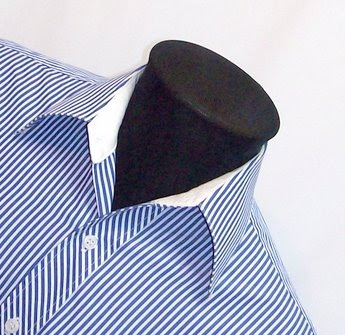 How to Sew a One Piece "Collar Plus Stand"
Shirt with Curved Placket...Classic with a twist! a classic dress shirt with some interesting design details. 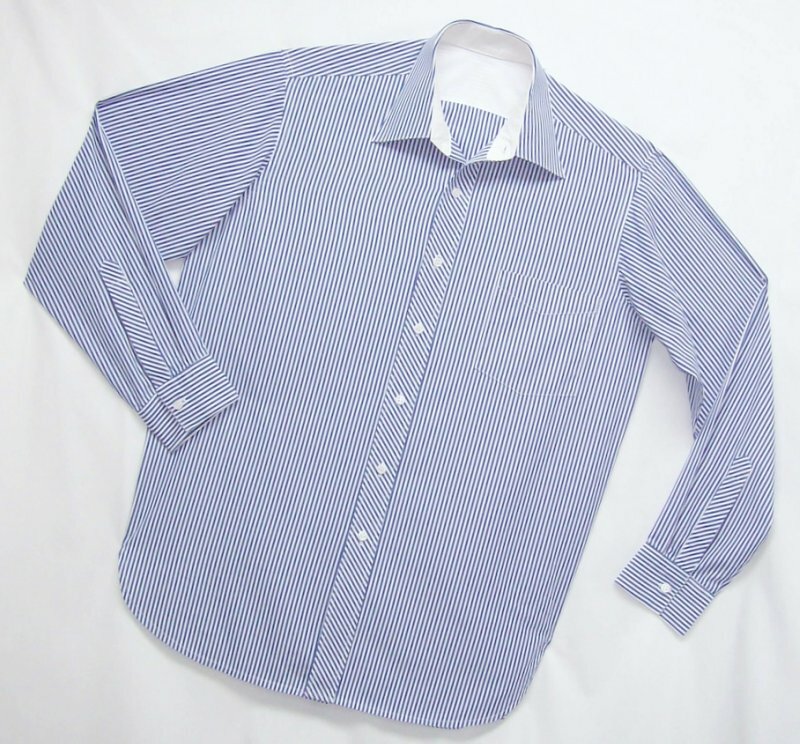 This shirt, made from fine Swiss Cotton shirting features a bias cut front button placket and bias sleeve plackets. Also, when you take a close look at the collar, you will see that its stand is not drafted with a curved front edge, rather it is straight...flush with the button placket. That is a great looking shirt! I've been thinking of sewing for my husband and that would be a great style. I love the bias cut plackets! Pam, you've started something now! I am going to make this squared collar stand ASAP. I love it! And I also like the way you used the stripes on the bias. That is a great looking shirt, Pam. I really like this one. I like the hem shape. Gorgeous work. Love the bias cut plackets. Really beautiful. Exquisite work, as always, Pam. Do you interface the bias areas with anything, that you wouldn't do on straight of grain? Sleeve plackets for example? Meredith...thank-you for your nice comment. I always stabilize bias details like the front button placket and sleeve plackets with interfacing cut on the straight grain. This way, I get the wonderful "look" of the bias, but the fabric is totally stable and does not stretch out of shape. Of course, If I cut the back shoulder yoke on the bias, no interfacing is used, likewise, I do not interface bias pockets. Pam, once again I am in awe of your talent. The shirt is great and love the bias details on the plackets. The straight collar stand would be an interesting detail. Even my DH loves it. MEN'S shirt? Not to me! I'd wear itin a heartbeat! Absolutely gorgeous details, but my favorite is the *white* interior stand and back yoke. The contrast is wonderful, but it's a detail the *wearer* knows about, and the effect suggests to me that as much care was taken with the seams and facings as with the bias-cut button plackets. There are a lot of interesting details in this one. I'll have to ask my husband about this style of collar. I can see it working for a work shirt that he wouldn't wear a tie with. Pam, I love it! The long bias placket is great and the bias front band breaks up the stripes a bit, giving a welcome point of interest. Your stuff is always so inspiring! I love playing with stripes on men's shirts. This is beautiful - such a "serious" shirt until you see the wonderful bias details. I really like the squared collar stand. I've learned so much about shirtmaking from reading your blog; I'm going to have to try another one soon just to try out that collar stand. Pam - This shirt is beautifully made and I'm taking note. I'm planning a few shirt this spring and will try to copy your style. Thanks for the inspiration! That shirt looks great! I only made my first men's shirt for my BIL this past Christmas, but now DH needs some. Thanks for the great pictures and inspiration!